Home / Arts & Culture / Shakespeare's "Merchant of NYC"
To stage The Merchant of Venice is courageous; to stage The Merchant of Venice so soon after the celebrated Al Pacino-led performance on Broadway even more so. The Washington Shakespeare Theatre’s production—a re-imagining of the play in 1920s New York—certainly does not lack for guts, but this madcap romp through the Lower East Side yields mixed results. In Director Ethan McSweeny’s beautifully staged production, Venice is New York, Antonio and his fellow gentry are Italian Mafioso—and the Jews? Well, they seem to be Lower East Side Hasidim. Ignoring the fact that the twenties were glory days for Jewish mobsters (think Bugsy Siegal, Meir Lansky et al.) 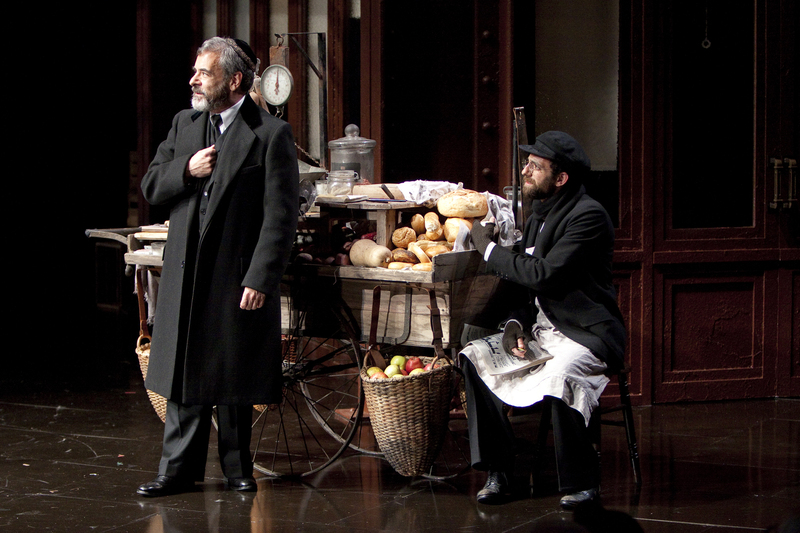 McSweeny chooses to dress his Jews in beards and payos, playing them as insular ultra-Orthodox. (This was especially disappointing for me, since I was secretly hoping Shylock would be a 1920s secular Yiddishist). Shylock himself is a diminutive man, soft-spoken, the weight of the world on his shoulders. Mark Nelson plays him well as a man weary of society’s cruelty. His Shylock isn’t overly sympathetic or noble: he’s simply tired. McSweeny does not seem overly concerned with Shylock’s ambiguous morality, often rolling over uncomfortable dialogue or painful moments. In some ways this refusal to be a Shylock apologist is a brave move, leaving the audience free to look at the play through other lenses, such as class, the complex relationship between people and money, and the issue of women as property (both Jessica and Portia are sought out both for their beauty and for their wealth). 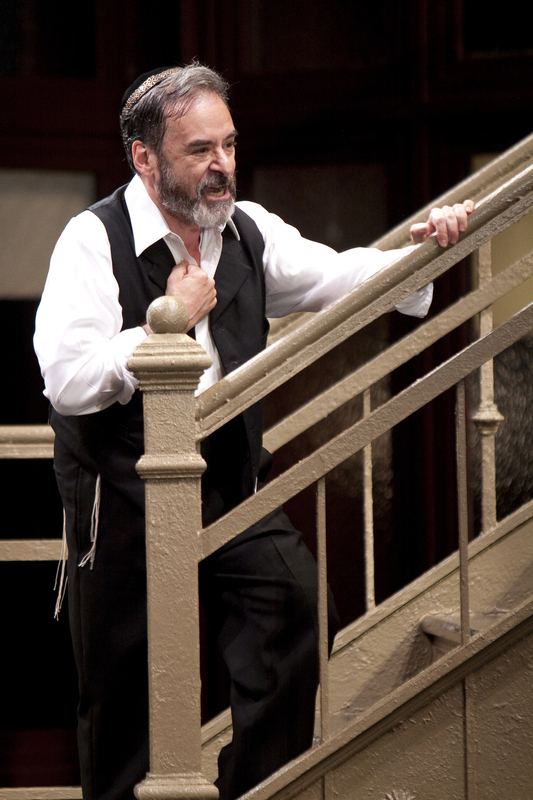 Sidelining the Jewish question also allows us to laugh, and McSweeny does put on a funny show. The scenes in Belmont with Portia and her suitors—the Prince of Morocco as a flying baron and the foppish Prince of Aragon, a Maltese in tow—are as clever as any of Shakespeare’s comedies. Moment‘s Sophie Taylor sat down with actor Mark Nelson to discuss the significance of setting the play in the 1920s, whether it’s anti-Semitic and how he portrays the unsympathetic Shylock. Moment: What appeals to you about Shylock? In some ways, Jessica’s desire to escape her own Judaism is more disturbing than Shylock’s character. I think she’s a great character, but the most interesting thing about her to me is her confusion, her ambivalence; about her father, about leaving, about Lorenzo. That love scene in the fifth act between Jessica and Lorenzo is not a love scene—it’s about betrayal. She’s wondering about what moved her to elope, what she’s left behind, and how to go on in a world that will never really embrace her. She can’t assimilate entirely, and she can’t delete her past. Do you see Shylock’s integrity in his refusal to assimilate? Yes, he insists on recognition of his validity, his dignity, at every turn of the plot, and once he’s been betrayed and robbed—of his daughter, his wealth and his bargain—he sees the law as a way to get his own dignity back. It feels impossible to see Shylock as a fully sympathetic character—how do you work with that? He’s not a fully sympathetic character—that’s not my job, to make a fully sympathetic character. But my question is, why is it different from watching Macbeth when he kills Duncan? Why is it different than watching Othello when he kills Desdemona? He’s not fully sympathetic—he’s a contradictory, dark and gorgeous piece of life. That’s my job – to make that breathe. And I think the difference is that people think because he’s a Jewish character with all this controversy around him that somehow his flaws and his acts reflect on Jews, and to me that’s nonsense. We should be confident enough and comfortable enough as Jews not to see a portrait of one messed-up Jew as a judgment on us, or casting a bad light on us. Should we picket The Godfather because it depicts Italians as criminals? No, that’s a parochial point of view on a majestic piece of art about all human beings. So why does the Merchant of Venice stand out the way it does? I think it has to do with a very understandable anxiety of Jews given our history in the 20th century, but I don’t feel the play itself is anti-Semitic or I couldn’t do it. It’s a story of bigotry on both sides, of judging by surfaces–choosing the golden casket—of what it does to a soul, of how a society creates its own monsters and how a loving father and a rational man can be driven by loss into a sociopath. I got the sense that Shylock was most offended that Antonio took the request for a pound of flesh seriously. Yeah, there’s no question in my mind that the bond starts out as a sport, but when things turn and Antonio defaults on the loan, the broken Shylock is in the position to get even and the bitter joke tragically becomes an opportunity for vengeance. I thought that moment of taking offense was well done, and important in humanizing Shylock. The role’s had a fascinating history over 400 years and of course it’s been done with every possible agenda in every culture and time, but I can’t imagine the character as anything less than a full person. Right, Othello is a full person, as are Shakespeare’s women. Othello is a great parallel actually, because blacks are as foreign to Elizabethan culture as Jews are, and there’s certainly a lot of the mythology and prejudice about blacks in that play, but the character himself is magnificent. A lot of people want to attribute a hatred to Shakespeare that may be true of his culture, but the evidence is that he insists over and over again on the irreducible personhood of every character. Going on that, the very lovable Portia becomes bloodthirsty and bent on vengeance in the courtroom. Does that give more depth to Shylock? That’s a great observation. The thirst for vengeance can look like a very good quality if it’s vengeance for your side. And if you’re looking at it from the other side, it’s a criminal trait. So who’s the villain here? This production has Shylock stripped of his yarmulke, which is very tough to watch. What was that moment like to play? I asked for it in rehearsal. So that was your addition? Yes, and it surprises me how shocking it is every night. How shocking it is to me to have it done. It’s a real evidence of the violence of the forced conversion. The actor who yanks off my yarmulke actually apologized to me for it. I hope it’s difficult for anybody to see. I hope anybody in the audience can feel how that must feel. What do you think bringing the play into the 1920s did? I think every night about my grandparents, who were all immigrants to Ellis Island as children. I love being able to use a Yiddish accent, which wouldn’t have been possible if it were set in the Renaissance, because I think it particularizes him. Everybody in this audience knows what the experience of an Eastern European immigrant to New York is, and what it means to come from a strong culture into an alien place that doesn’t welcome you. How do you hold onto your roots and still fit in and face that kind of resistance, that hatred of difference, and that demand to conform? That’s a central issue in Shakespeare’s play, and I think the setting makes it palpable for us. As for Jessica, you know, even today Jewish kids make choices about how Jewish it’s cool to be in America, and how much they want to flatten out their difference. The temptation to be mainstream: that’s what Jessica’s drawn to. She hates being different from the cool kids she sees out that window. And that innocent yearning starts a chain of terrible events. You played the “hath not a Jew eyes” speech in a very tired and weighed down way. Why? I learned that the Nazis used the play as propaganda in the thirties. In Shakespeare and the Jews, James Shapiro says it was used by the Nazis, but that in order to produce it, they had to cut the “hath not a Jew eyes” speech because it was too sympathetic to Jews, and because it justified Jewish revenge. They had to cut Leah’s ring because it brought too much pity to Shylock, and they had to make Jessica his foster daughter because a genetic Jew couldn’t be seen to be loved by an Aryan. Which is a completely different play. I like that, that’s great. Thank you. Fascinating interview. Too bad your critic didn’t think as deeply about the play as the actor.